It is time for the first question in the Teatime Conversations series. You all asked some good questions! I have received four questions so far, and I plan on answering each of them in the coming months. It has been hard to keep up with blogging in the midst of getting ready for a new baby, but I should be able to answer the first four questions before Stafford comes. If I am able, I will answer more questions too. 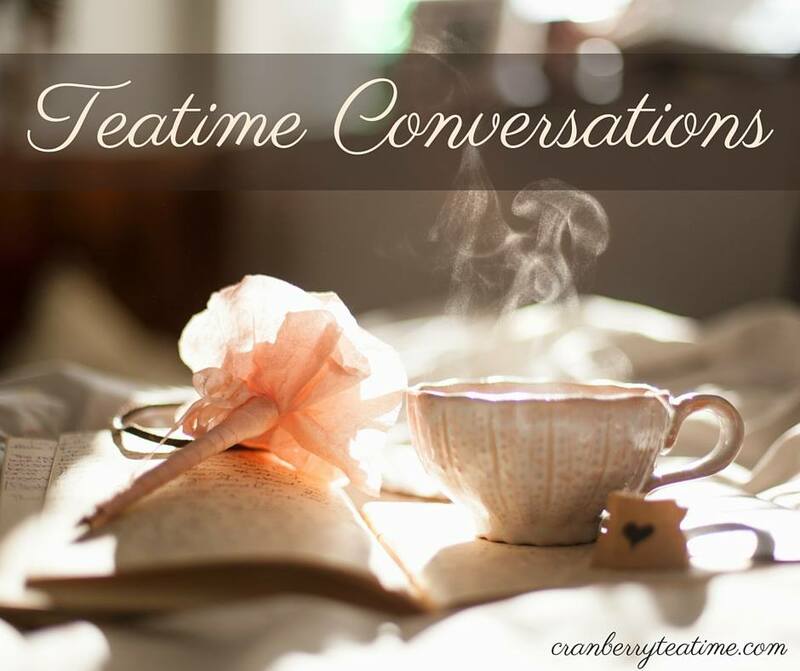 Do you have a question for a Teatime Conversations post? You may email it to me at RachelLundy(at)cranberryteatime(dot)com, or you can send it in anonymously through the form here. Reader Question: Hi! What are the best and hardest things about being a mom? There are many things I love about being a mom. I love children, and I really enjoy spending time with my kids. As energy permits, I love to play games with them, read with them, talk with them, and simply enjoy their company. I love watching my children grow up, learn new things, and become more independent. But I also love the little stage, and I am looking forward to having a little one again next year. Holding a baby is a special thing, and I love the toddler age too. Toddlers say the funniest things, and toddler quotes are something my family is looking forward to enjoying! I think it will be fun to begin the baby stage again while also raising elementary and middle school age children. It is such a privilege to raise a child to know, love, and serve God. Seeing a child come to know Jesus, and then grow in their relationship with Him, is a wonderful thing. It is a joy to have a front row seat to seeing God work in a child's life, and it is an honor to be able to have an impact for the Kingdom through the work of parenting. One of the hardest things for me about being a mom is the total exhaustion and limitations that come with motherhood and chronic illness. I wish I could be a healthy, active mom. I wish I could volunteer at my children's school. I wish I could be a chaperone for field trips. I wish I could get up in the morning, make breakfast for my children, and send them off to school. It still grieves my heart to not be able to do those things. I remember a time when Adelaide was about two years old, and she wanted so much to be with me, but I was too tired to let her come be with me in bed. She was a very active toddler, and she would not have been able to be still and silent like I needed that day. Will had to close the bedroom door and keep Adelaide out. She didn't understand. She just knew that she wanted to be with her mom, and I heard her crying for me outside of the door. As a mom that was incredibly hard to know my daughter wanted me, but that I was not able to meet her needs. It is hard to always know what to do as a parent in various situations, but that can be a good thing too! It keeps me humble and reminds me of my need for God, His strength, and His wisdom. Motherhood is hard work, but it is worth it. The souls of our children are worth it. God's glory is worth it. And now we would love to hear from you! If you are a mom, what would you say are the best and hardest things about being a mom? If you have a chronic illness, how does that affect your role as a mother?